Just sometimes, when I wake up very early and creep into my very cold tiny office, pitch black sky filtering through my voile curtain, I feel the urgent need for comfort food. On goes my computer, bought back to life by my freezing fingers, and comes to my rescue. Look what I discovered this morning – the most amazing Giant Potato Rosti recipe that looked so comforting, crispy and delicious that I am going to make it today in my new kitchen. And freeze one for over the Christmas holidays. Take a look at this very special dish. 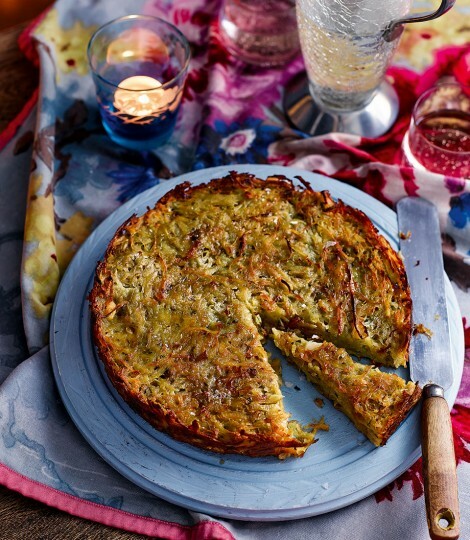 Giant Potato Rosti Recipe – courtesy Delicious mag. This Giant Potato Rosti recipe is a fantastic dish to eat straight away, make the day ahead or freeze. A perfect one to have in your freezer for over the holiday season, just in case friends pop in unexpectedly. You can make the Rosti up to 8 hours ahead, keep in the tin and heat in a 180C/160fan /gas4 for 20 - 25 minutes to warm up. Or freeze the cooled Rosti in its tin, well wrapped in cling film, for up to 1 month. Defrost well, then warm through a medium oven to serve. It can serve 8 as a side dish, or 4 with big appetites. Put a large slug of olive oil and a large knob of butter in a frying pan over a low-medium heat. When hot, add the onions and garlic and cook for 15-20 minutes until soft, sweet and golden. Add the thyme for the last few minutes. Cool slightly. Meanwhile heat the oven to 200C/180 fan/gas 6. Grate the potatoes on a box grater and wrap in a clean tea towel. Press the grated potato hard against the side of the sink for a few minutes to squeeze out as much liquid as you can. Grease a 23cm shallow-sided cake tin with a removable base (not a spring clip tin, from which the Rosti would be difficult to remove). Put the squeezed grated potato in a large mixing bowl with the cooled onion mixture, together with the salt, eggs, chives and some freshly ground black pepper. Mix well with your hands and put into the cake tin - don't pack it down too tightly. Cook the Rosti for 1 hour, then remove, dot the 30g butter all over the surface and put back into the oven for another 15 minutes or until golden brown on the top. Remove from the tin and serve straightaway or just warm. Well, I don’t know about you, but when typing this Giant Potato Rosti recipe up, I swear I could smell it in my little office. And wouldn’t it be so easy just to add a couple of fried eggs on top! It is such a versatile recipe and could be used with all sorts of meat or fish, or just with a fantastic crunchy side salad on the side. I can’t wait to cook it tonight.